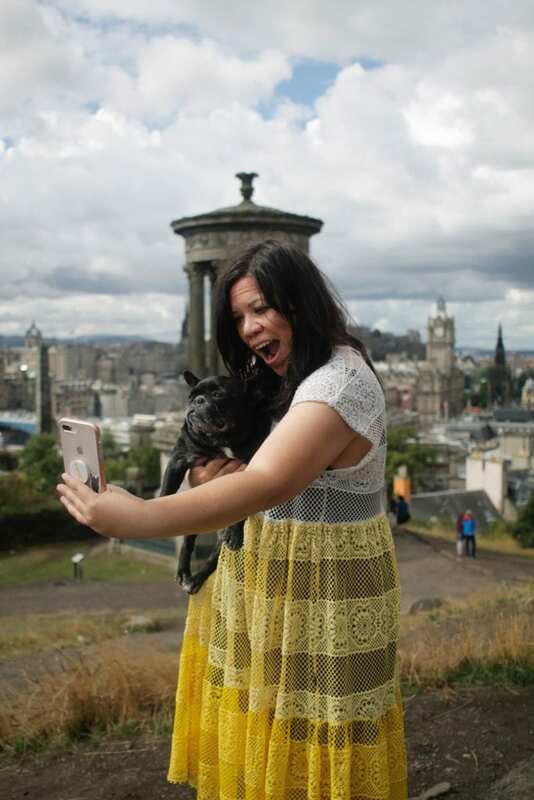 The Most Instagrammable Spots: Edinburgh Edition - Where's The Frenchie? 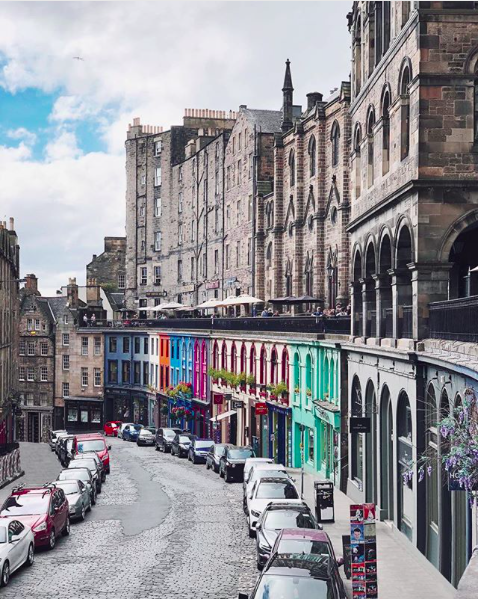 The mission for Edinburgh, which offers everything from the Queen’s official residence, Holyrood Palace to bagpipers in kilts, Harry Potter locations, mountain hikes and gentle Scottish accents even your hard-of-hearing aunt can understand. Let’s hope auntie knows how to snap a photo without decapitating you. If nothing else, a “fail” album is always a hit. 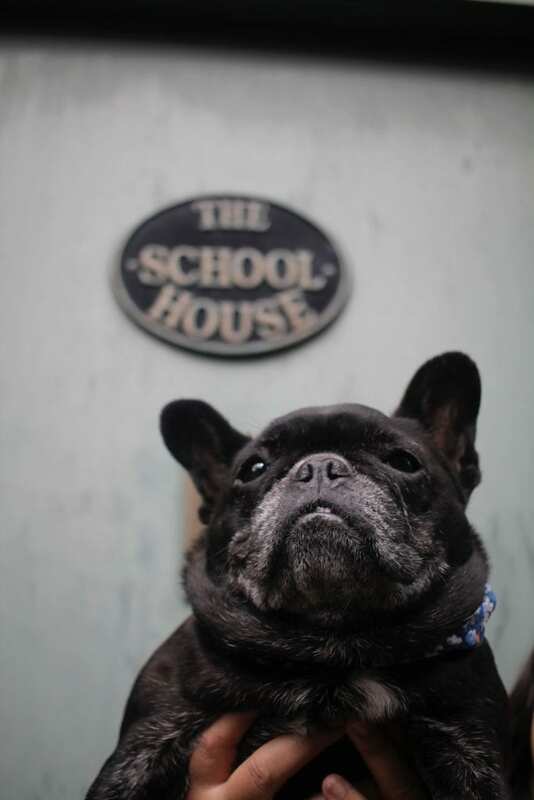 TIP: if you have a shot in mind that requires the work of several humans and a dog, have the other subject stand/sit/bark/snooze in the space, take a test shot, show to the person pressing the button exactly what you had in mind. No need to lose your mind, when a little paw-holding can make the difference. The overall arching theme was unicorn spotting. 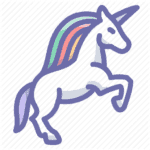 The unicorn is a strong and untamed animal, thus appearing in gold chains on various Scottish Kings, starting with William I in the 12th century, coat of arms. Think of a coat of arms as the status symbols from back in the day. A Gucci bag is much more portable though, so feel free to send them through. TIP: A theme ties together your content and allows your followers to come along on your travels. Stories or daily snaps make multi-posting a theme a lot of fun. It was a natural fit for our first theme to be finding unicorns. Elle rescued a unicorn from the Forbidden Forest on her sixth birthday named Fifi. Queen Elizabeth’s coat of arms has both a unicorn and a lion. Who says royals don’t believe in magic? 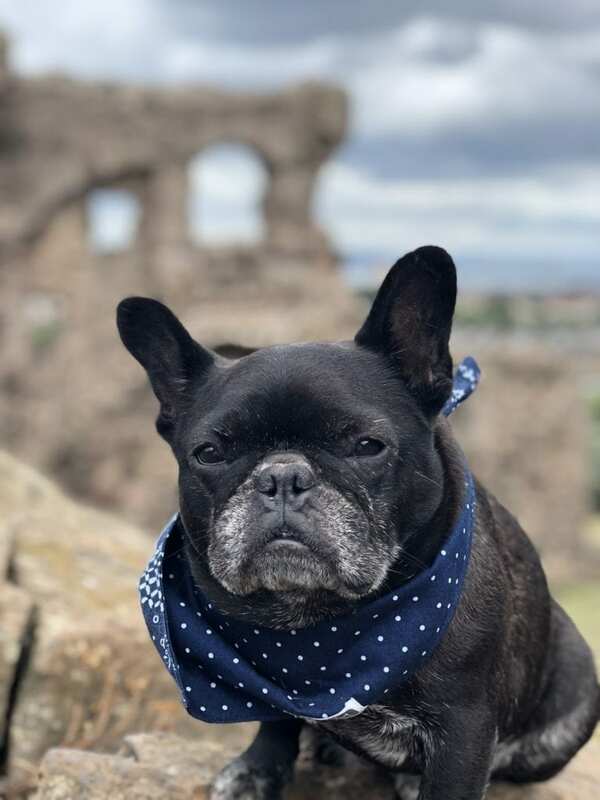 A view of the formidable Edinburgh Castle, centrally located like the Eye of Soren to fend off predators, like that bish who takes photos of your beloved dog without asking. You know who we mean. Actress Naomi Watts is our hero for snapping back at a “sneaky photographer” capturing her photo on the subway. We do “snap back” or ruffle hair back so always be sure to ask before reaching out for a dog/person before taking their photo. In the age of privacy being a mere wave of the hand. Back to the point, The Vennel offers great height and enough distance from Edinburgh Castle to offer more of the castle in the background. 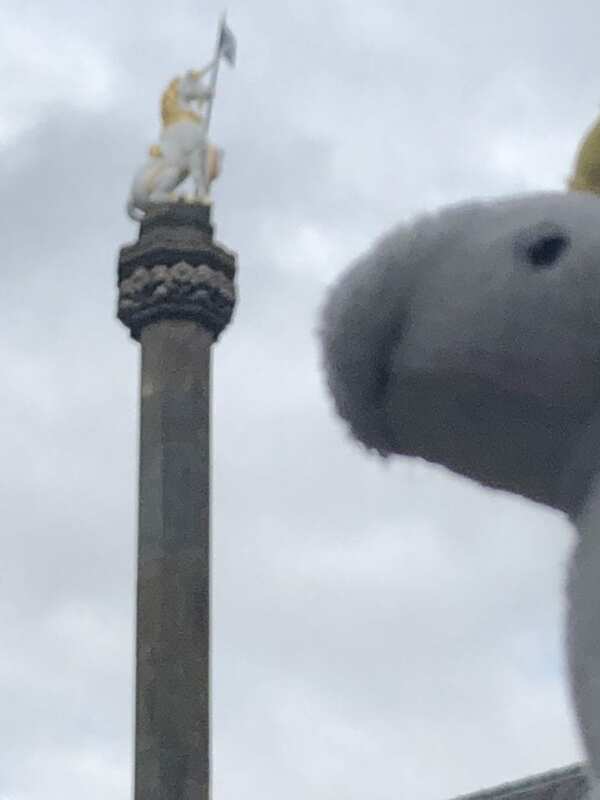 Our first unicorn was atop the Mercat Cross, in Parliament Square. 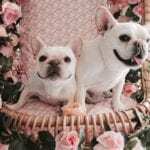 This was extremely hard to photograph with Elle. The best a local government worker could get still had me in full dog mom mode, holding her aloft but the unicorn blurred in the background. En route to Arthur’s Seat, for some nature shots and a day that needed no filters, we were happy to spot another unicorn atop a church. 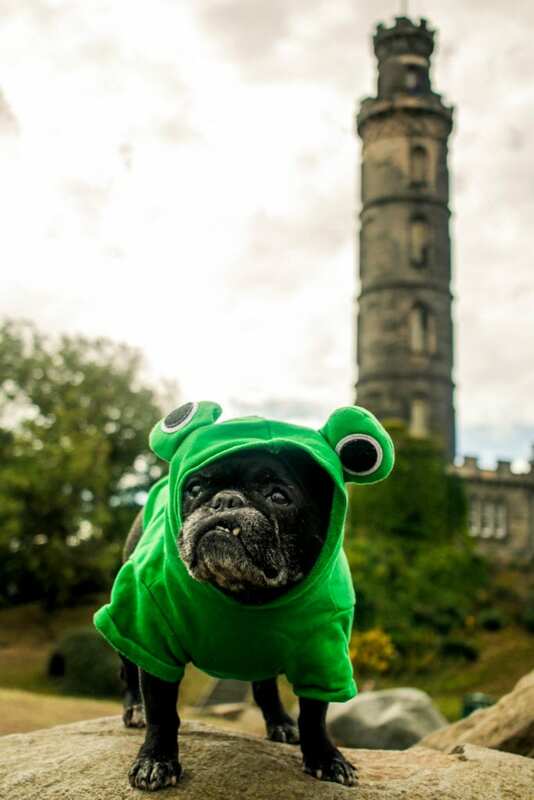 Cool—yet the best ones were those guarding the Holyrood Palace, which sits at the base of Arthur’s Seat. It seemed the unicorns were guiding us toward’s Arthur’s Seat. There are two paths and hikers will instantly select the right, which I did. Twenty feet into the climb it became steep and I “pulled over” to access what to do next. It’s never worth endangering yourself or others, in this case, Elle to get a shot somewhere. I saw a sign with a rock falling warning and decided this wasn’t our path. As I was bending over to pick up a backpack, two hands reached down to try, unasked, from behind me, for Elle. 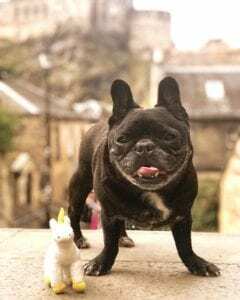 Given our precarious surroundings, I didn’t want to react too harshly but when I turned my head to see who was making the attempt a headline in my mind: American Tourist Kills Elderly Scottish Woman Trying to Grab Her French Bulldog. Uh huh, now you know why the secondary theme was “keep your hands to yourself.” I sternly, but calmly requested the passerby not pick up Elle, when a water bottle fell off my backpack and the woman realized she was causing havoc. Once she was clear, we headed back down and to the left, gentler path. The path ambles along, slowly rising until there is a bend revealing the ruins of Saint Anthony’s Chapel. It was straight out of a novel on the ideal Scottish terrain. The abbey ruins overlook a lake at the bottom fulls of swans. Elle went into her backpack when I saw the path was a little narrow and there were a lot of tourists, due to the Fringe Festival and summer holidays. Once we reached the top, it was truly worth it. Elle wearing @shopariandm at Saint Anthony’s Abbey. There are some shots where you’ll need another person’s help. Fortunately, Air BnB now has experiences, where you can easily connect with local guides and great offerings. I came across a walking photography tour with @itsalexhamilton. A local college student entering his last year of uni, Alex was the perfect host to show us great spots around Edinburgh. We chatted as we walked over to our first destination. 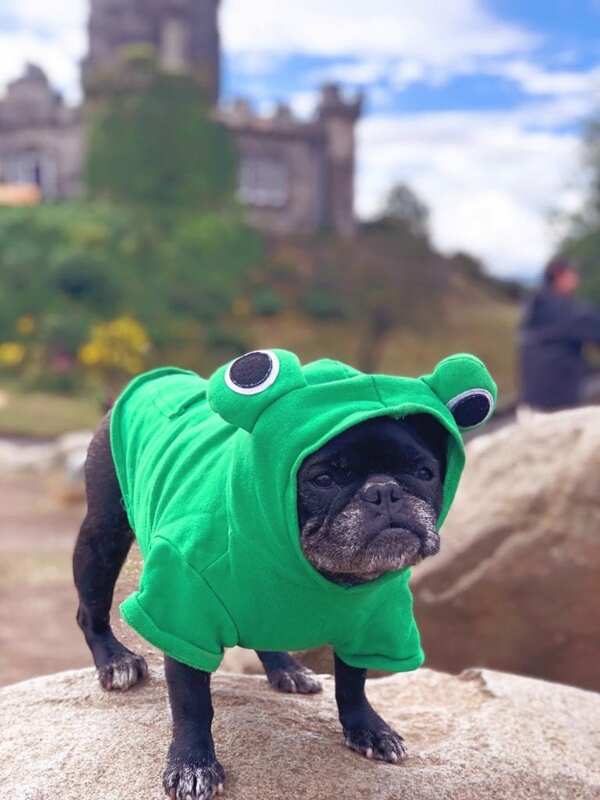 TIP: Always ask a host if the offering is dog-friendly, how many other participants there are and any other questions prior to booking. Look at their social media accounts and read reviews in case to properly set your expectations. 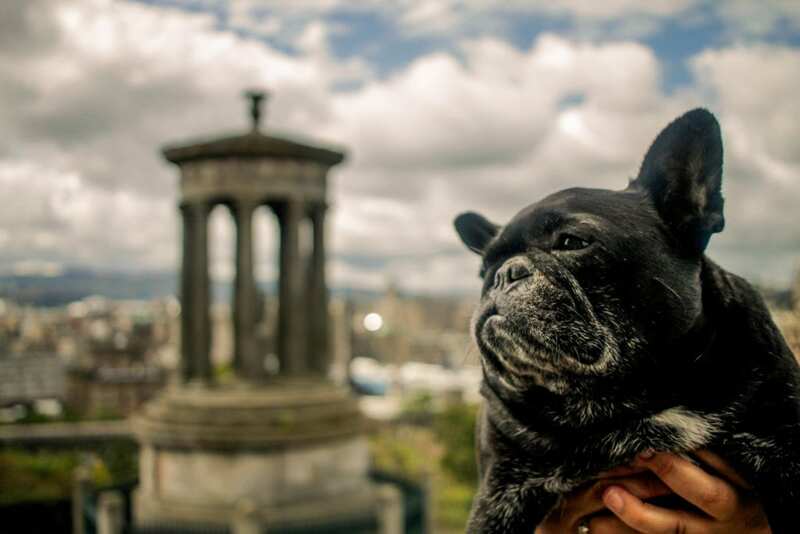 Edinburgh has been dubbed the Athens of the North because of the structures on Calton Hill. Offering a mountain view with easy city centre access, and not as challenging as Arthurs Seat’s steep climbs, Calton Hill is a must. The views of both the sea and being in the centre of the city, allow views of the tallest writer’s monument in the world. Being a writer, that greatly appeals to my sense of the importance of words that has been lost with so many people using unattributed quotes, memes and captions from other people without a second thought. It has also earned Edinburgh the “Athens of the North” moniker for structures that resemble those in Athens. I thought of this as Notting Hill’s Northern Cousin, with less foot traffic and delightful door knobs. Elle seemed right at home with charming houses and benches and flowers on the lane. Alex and Elle seemed to have bonded with her licking him a few times when he went to take her photo. Be careful, this is an active roadway and drivers seemed to delight in speeding through the cobblestone streets. 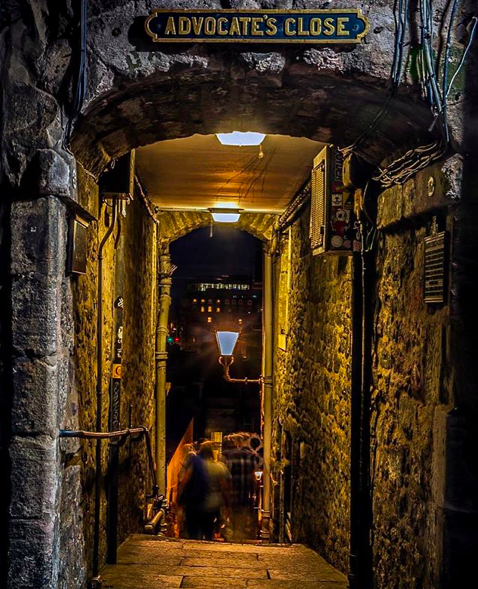 Rumored to be the inspiration for Harry Potter’s Diagon Alley, Advocate’s Close is one of many incredible doorways that will have you imagining Death Eaters swooping down on you at night. We didn’t get here with Alex, but he does include this on his regular tour. Approaching from the second level gives you a better bird’s eye view, but is a bit tricky for a small dog if that is your model and muse. Remember again, this is an active street, and you have to be aware of your surroundings but this colorful street is quite delightful.